You need to have an ICICI Bank account with fund transfer facility enabled. In case you do not have it, you can get it enabled through your ICICI Bank Branch. 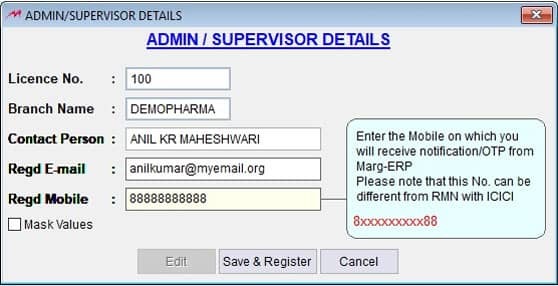 You need to have the updated Marg Product (counter/Silver/Gold/ERP) which can be downloaded from www.margcompusoft.com or by visiting this link. 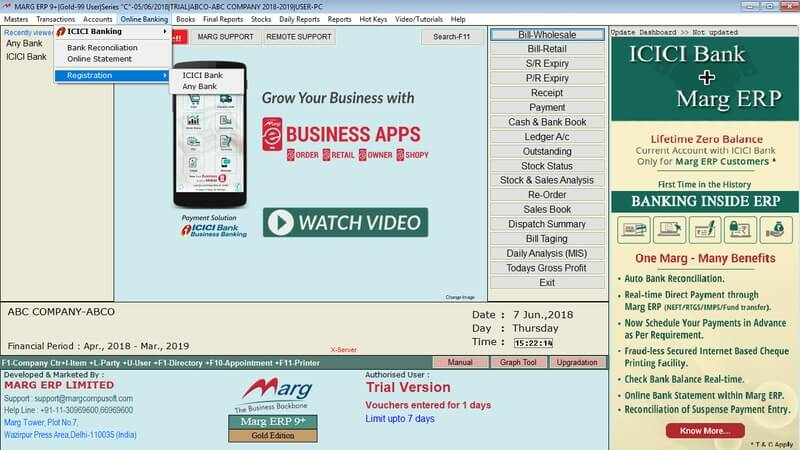 You can also use free Marg trail period to have an experience of connected banking. We recommend you to take backup of your data before proceeding. Your data will stay intact after the installation finishes. You should also have your ICICI Bank CIB login credentials with you. Only Marg supervisors are authorized to perform registration through Marg platform. All values will be masked with*. You can check show values to see the actual field values. It is implemented as a security measure. Step 1: Navigate to 'Online Banking' tab and select 'ICICI Bank Registration'. Step 2: Enter the admin details in the window appeared. The Mobile number and E-mail would be verified with OTP. This will be used later to send an OTP in case of any system change or security related transactions. This may or may not be the same email id and mobile number which you have used while registering with the bank. Click on 'Add' button to register a new bank account. Select the ICICI Bank account number you want to register from the given drop down. Account number will get automatically updated from the Bank account ledger. 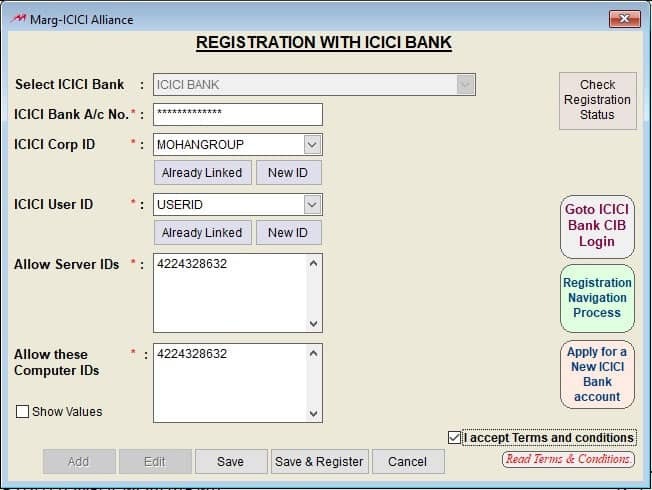 Only ICICI Bank accounts configured in Bank ledger will appear in the registration list. In case you want to register a new account with the same Corp-ID/User-ID, you can use the already linked field to select the appropriate Corp-ID/User-ID and then click on Save. Step 3: Enter your ICICI Bank Corporate internet banking CORPID/Client ID as provided by ICICI Bank. Step 4: Enter your ICICI Bank Corporate internet banking USER ID as provided by ICICI Bank. Step 5: Only, the users who have the Server IDs will be permitted to initiate payments. Step 6: Only, the users who have their Computer IDs will be permitted to initiate payments. After you have verified all the details, you have to click 'Agree to Terms and Conditions' and click on 'Save and Register'. In order to complete the process, you have to login to your ICICI Bank internet banking website and navigate to pending on me > connected banking approval > Marg > Approve > confirm. Step 9: After confirming, you have to wait for 1 hour to make payment, reconcile, check current balance, statement etc within Marg ERP. You can check your registration approval status by clicking on 'Check Registration Status' on top right-hand corner of registration window. We will send you an E-mail/SMS once your registration is approved.